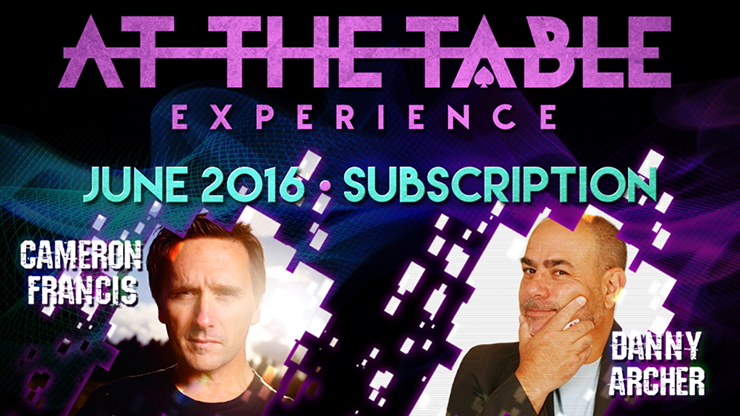 Today, when you order "At The Table June 2016 Subscription video DOWNLOAD", you'll instantly be emailed a Penguin Magic gift certificate. You can spend it on anything you like at Penguin, just like cash. Just complete your order as normal, and within seconds you'll get an email with your gift certificate. As a close up magician, Cameron is well known for his off-beat, quirky style of magic. He has performed all over the country including the Close Up Gallery of the world famous Magic Castle in Hollywood. He is also a regular performer at Wizardz Magic Theater in Orlando. His appearance At The Table is going to focus on tricks that happen in the spectator's hands. The magic is the spectator's hand and is some of the most powerful magic that can be performed and Cameron will show you everything you need to know to create otherworldly moments right in their palms. To add to the lineup, we give you Danny Archer. Danny Archer started doing magic as a hobby when he was 29 years old and has since circled the globe with his highly sought-after lecture. Danny runs the largest mentalism convention, MINDvention and has been a cornerstone in the mentalism community ever since. His material has appeared in publications like; MAGIC, Linking Ring, Genii, Channel One, MUM, Infinity and several international magic publications. His magic is visual, dynamic and created to be performed in real world situations. He uses simple props to present complex magic effects that people never see coming. If you haven't experienced Danny, here is your chance.